Featured Image: President Pranab Mukherjee,to his left Jangipur MP Abhijit Mukherjee, and to his second right Behrampore MP Adhir Ranjan Choudhury during the inauguration of Behrampore Military Station at Nabagram in Murshidabad on Saturday. 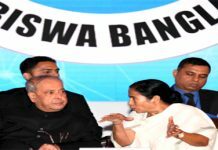 Behrampore, 08 October: PRESIDENT Pranab Mukherjee today inaugurated the newly developed Behampore Military Station (BMS) at Nabagram in Murshidabad amidst characteristic military fanfare. The function was attended top brass of the military in eastern India, representatives of the Bengal government, MPs, and other dignitaries. 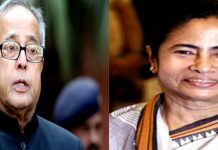 Among the MPs present on the dais were Behrampore MP Adhir Ranjan Choudhury, and Jangipur MP Abhijit Mukherjee, who also happens to be the President’s son. 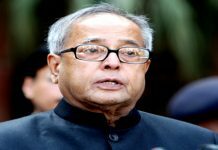 The President arrived at BMS by an Indian Air Force chopper and was received by Lt Gen Praveen Bakshi, the General Officer Commanding-in-Chief of the Eastern Command headquartered in Kolkata. His cavalcade was ushered in through a newly constructed main gate of the BMS. Later, the President unveiled the Inauguration Wall of the BMS and planted a sapling of Chhatim tree. Towards the end of the event, he embarked on a windshield tour of BMS campus and he briefly interacted with the troops of 17 Corps and the ex-servicemen residing nearby. Lt Gen Bakshi thanked President Mukherjee for his personal indulgence in ensuring the allotment of 252 acres of land on which BMS has come up. President Mukherjee complimented the Army for having developed the station with commendable speed after the foundation stone had been laid by him just 32 months ago in February 2014.